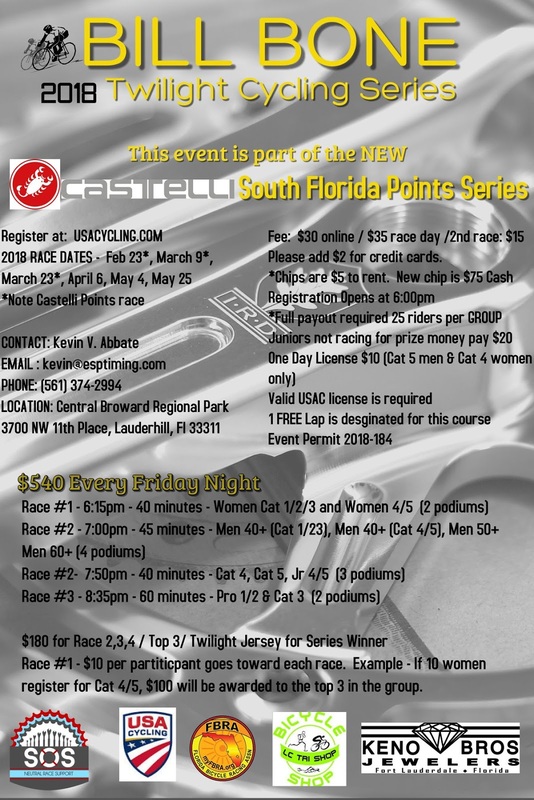 "The only evening race in South Florida (Friday nights under the lights) - Prize Money every Friday Night. The race for each night is a follows. **Each group will race for $180 in cash (awarded to the top 3) along with swag. Women prize money sample. If 10 women register for the Cat 4/5/ race, $10 for each women will go towards the payout for only the 4/5 race or $100." **7:50pm - Men Cat 4, Men Cat 5, Juniors 4/5 (There are 3 podiums in this race and potential jersey winners). This is a 40 minute race. **8:35pm - Cat 1/2 and Cat 3 (There are 2 podiums and potential jersey winners in this race). This is a 60 minute race.